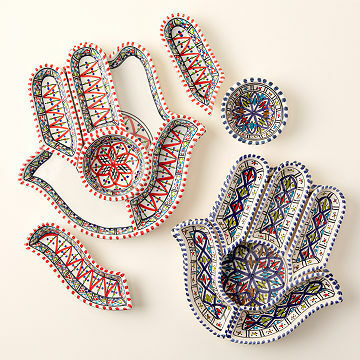 Artisans in Tunisia handcraft this stand-out piece, inspired by the ancient Hamsa symbol of protection. When your guests ooh and ahh over this stand-out server (and they will ooh and ahh), you can tell them this: It's inspired by the ancient Hamsa symbol of protectionsaid to bring happiness, health, and good fortuneand handcrafted by artisans in Tunisia. They shape clay imported from Italy, let it bake, then engrave and paint the intricate design using plant-extracted dyes. Use the five removable sections for snacks and dips, and the tray is a good size for cheese or mezze spreads. Are we in a breezy cafe in Morocco, or your living room? This piece makes it hard to tell the difference. Designed by Dhia and Firas Rabiai. Handmade in Tunisia. While filming a documentary in Africa, brothers Dhia and Firas came across another art form: handmade goods by fellow talented Tunisians. They wanted people to be able to experience the feeling of traveling to far-off places without leaving home, so they created a home decor collection inspired by the ancient Hamsa symbol, said to bring protection, happiness, peace, and prosperity. The people who make the vibrantly detailed pieces are just as important to Dhia and Firas' business. "We believe that the touch of smiling artists outweighs the monotony of mass production," they say. "As we grow, we envision a platform where local enterprise can reach the world with their own, original products, and where you can find something worth being proud to own." I bought this for my sister-in-law's birthday, and she loved it! Fantastic conversation piece, very versatile in practicality, and just beautiful! It's just really beautiful and cool. I hope my sister loves it. I wish for one my self. Bought this as a gift for an aunt- it was a little smaller than I expected but even more beautiful in person (to be fair I didn't REALLY consider the measurements before hand). It came packaged very carefully and had a little picture and write up about the artist/creator on the box which I think is a really nice touch. She hasn't received this yet but Im confident she will absolutely love it- I know I do! I have purchased several gift items from uncommongoods in the past, but never for myself. When I discovered that I didn't have enough pieces to entertain with and found this one online. It is perfect! It just arrived and I can't wait to use it! LOVE this plate! I'm so excited to give it to my sister for Christmas! It was covered thoroughly in the packaging so it arrived safely. It's perfect for entertaining - little dips and snacks can go in each part. I also love uncommon goods products, and this one did not disappoint! Although it was pricey, I feel it was worth it because it really is unique and I just know my son and his wife will enjoy using it every time they entertain.